A lot of studios nowadays do their best to finish up development of a multiplayer game by organising beta sessions. That way they can test their servers, get valuable feedback on certain features, and balance and fine-tune weapons or in-game items. EA and BioWare are holding two such sessions for their upcoming sci-fi RPG, Anthem, one of which just ended this past weekend, and another coming up in a few days. I had the chance to partake in the first session, spending more time trying to get the game running than actually playing it. 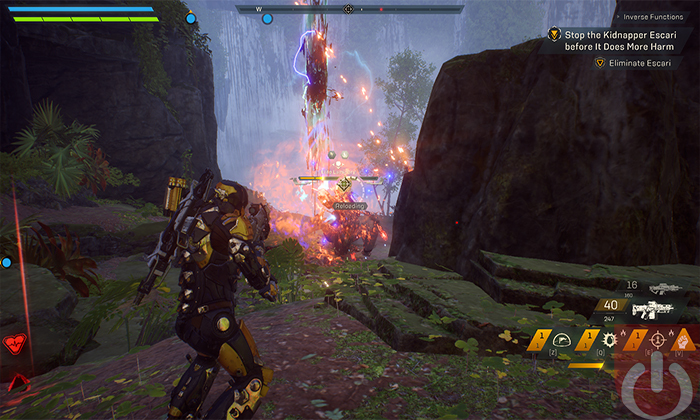 Anthem’s VIP Access beta period kicked off on the 25th, however, it did not actually work until the 26th. The majority of players reported connectivity issues, login failures, and random crashes, alongside the infinite loading screen, which plagued the beta throughout its existence until the very last minute. I experienced all these first-hand and had to restart the Origin client and my laptop several times before it stabilizes and finally works, for a few hours that is. 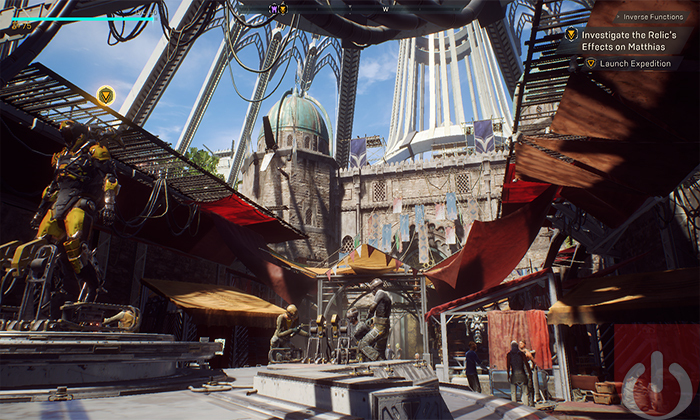 Once Anthem finally worked, and I got to see the first glimpse of Fort Tarsis, I was astounded with the level of detail and thrilling visuals. Although the VIP demo doesn’t showcase a whole lot of the final game’s world, what you get to see is breathtaking. The bustling streets of Fort Tarsis, merchants buying and selling Javelin parts, hammers pounding away, murmurs all around you, and at the centre of it all, your Javelin rests on a circular rotating panel. Players get the chance to play out a whole mission, helping Arcanist Matthias Sumner – a seemingly important NPC – recover an item called the Manifold. As a freelancer, you are one of the few brave enough to wonder in the world outside of the protected fortress walls, facing the Dominion’s threat and bizarre ferocious predators. After talking to Matthias and knowing what you need to recover and the threat that awaits you, you’re allowed to prep for the mission, switch to a Stronghold (raid) mission or just wander around in freeplay. When it comes preparations, players can customize their loadout, consisting of primary and secondary weapons, support gear, grenades, assault launcher, and even special components earned through mission loot or crafting. 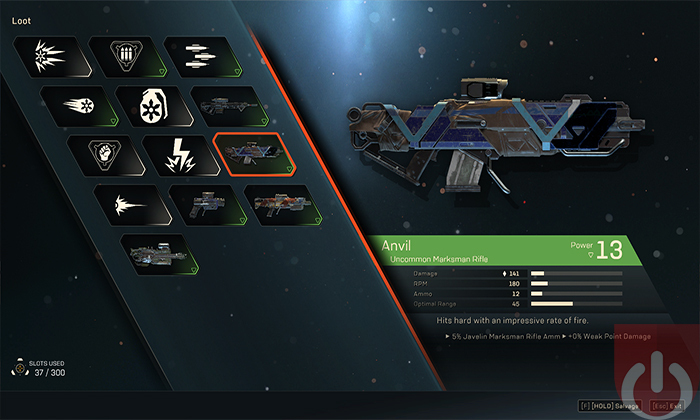 These components can boost a Javelin’s speed, enhance its armour, strengthen its abilities, and much more. The part where I found myself spending the most time, and I know I will spend even more when the final game comes out, is in the appearance customization menu. Here you’ll be able to change your Javelin’s appearance by changing the materials used for each part, donning weird colour combinations, attaching vanity items and quirky decals. The unlockable and purchasable options are extensive; I saw a couple Iron-Man replicas running around. I personally bought the Terminator-y headpiece before turning my Javelin into an elegant black and white killing machine. 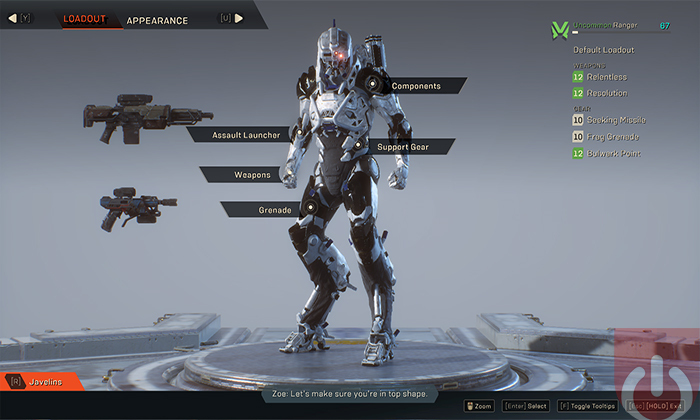 BioWare managed to nail down customization, making it fun to spend time just tweaking your Javelin to your preferences. Now after spending an hour changing my Javelin’s colours, and finally settling on my weapons loadout, I head off to my first mission. The game tells you where to go using small blue arrows that act as checkpoints and NPCs that communicate with you throughout the mission. Looking for the Manifold, you’ll fly towards an area with lush greenery and lots of mountains; the astonishing scenery welcomed me as I hovered in the air. This is where the real fun started as I was confronted with my first set of enemies. Using my Javelin abilities, and trusty assault rifle, I was able to take them down with ease. Following that, Matthias explained where I need to go to next. I would face more waves of enemies along the way before finally taking the Manifold and heading home. The thing Anthem managed to do so well is how fast-paced, chaotic, and explosive it looks on your screen. Flying around with your Javelin, unleashing rockets, using your ultimate to take out an entire horde of enemies, landing down with a powerful strike and melee attacking the remaining enemies – it all happens so fast. It’s all extremely fun and enjoyable though. The tremendous visuals add so much to the experience when everything explodes around you, and you see the small particles of the enemy’s head you just blasted off fly across the screen. If you don’t have friends to group up with to form a full squad, the game fills your playthrough with random people. 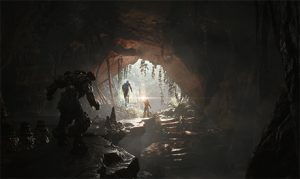 This is good news – though Anthem’s difficulty scales based on how many people are in a group, you’ll still need to coordinate your attacks and revive those who fall in battle in order to complete the mission. When you find the perfect synergy between your squad, you’ll be able to do some devastating combos using abilities from different Javelins. Like when someone freezes a bunch of enemies and you follow up with an ultimate move that blows them all up. The game doesn’t tell you there are combos you can do together or guide you through them, but instead, tasks you with discovering them on the battlefield alongside friends. All of these elements combined make for one of the most enjoyable multiplayer experiences. At least, that’s the case when the game is actually playable. 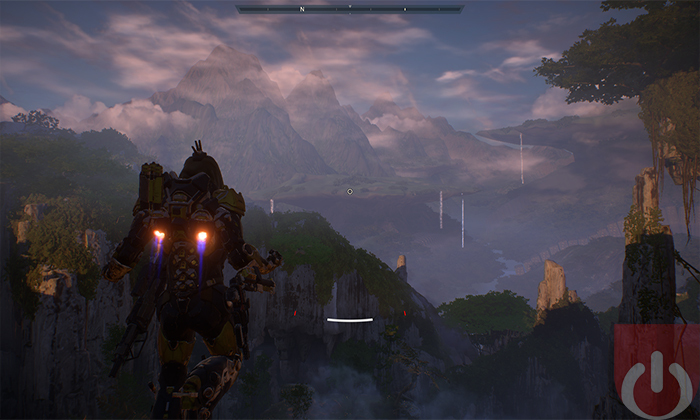 I mentioned several times how visually pleasing and astonishing Anthem’s world is, but at what expense? Well, at the expense of your PC’s CPU burning up. 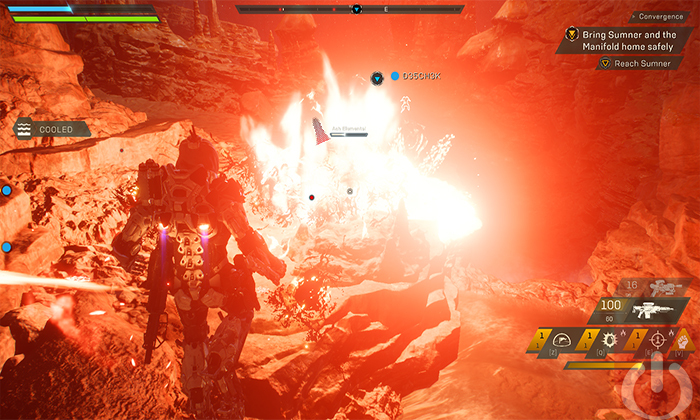 Anthem gives PC players the standard set of graphics settings to play around with, nothing too fancy or too specific. I ran it on my gaming laptop with 12GB of RAM, an Intel Core i7 processor at 2.6 GHz, and a GTX 965M graphics card. While these specifications are comfortably above the minimum required PC specifications set by EA, I had to keep the game at 720p and on the lowest graphics settings so it would run relatively smooth. Not only that, Anthem weirdly causes your CPU to stay running at an atrociously high level after shutting the game down. It wasn’t just my PC doing it, my friends whom I invited experienced the same issues. All our PCs heated up, causing any open programs to run sluggishly. I don’t know what the game does in the background to affect my PC (even after closing the game), but it definitely does something. In addition to that, I ran into the infinite loading screen quite a lot. I was never able to play continuously for more than an hour maximum before facing the “bar of doom.” Either that or the game completely crashes while going into or finishing a mission and going into the rewards screen, which actually prevented me from collecting my loot or even levelling up properly. Another bug my friend and I experienced was how your entire screen shakes whenever you shoot at something. Our first playthrough was one of the most annoying and dizzying game sessions I’ve ever experienced. Thankfully, for some reason, it disappeared on Saturday night. Finally, the Origin client isn’t the easiest to handle, with multiple pop-up screens, weird bugs, and a couple of other issues. I always kept into consideration that this a beta and won’t judge Anthem’s performance nor technical issues based on this past weekend. However, if some of these issues carry over to Anthem’s released, BioWare will have a very bumpy launch to contend with. Players going into an anticipated game’s beta period are always optimistic and enjoy every little thing going on, even if deep down they know when they play the full version, it will eventually bother them. I’m sure that’ll be the case with Anthem. Being one of the most anticipated titles of 2019, it was only natural for me to try and grab as much loot as possible, explore every inch of the map and customize my Javelin to the fullest during the beta. However, now the honeymoon period is over, I’ve come to realise that I won’t have this same enthusiasm and tolerance to grind for everything when Anthem is released. I did enjoy my time with the game so far. But there will come a time when once exciting missions turn into a sequence of flying into battle, killing the same old creatures, collecting loot, scrapping it for coins, rinse and repeat. I understand what attracts people in this aspect, there is always a sense of accomplishment when you finally acquire that piece of exotic gear you spent hours looking for or finally have enough coins to customize your Javelin just the way you want. Ok, but what comes after that? Anthem is an exquisite looking sci-fi action RPG/shooter, with a solid combat system and a plethora of items/customization options to hunt for. It even appears to have a story that might be worth investing in. At the same time, the game feels like a slightly better version of Destiny with a BioWare spin – there’s some Mass Effect in there as well. And, depending on how you felt about Bungie’s series, you’re either going to find Anthem’s gameplay pleasant or repulsive. That said, we’ll have to wait and see how things progress given the technical issues and feedback from the fans. There’s also the potential for missions that don’t follow the fly, kill, grab loot formula and great end game content. Will it be one of the best third-person shooters around? Again, we’ll have to wait and see. Anthem’s open beta period kicks off on February 1st, with the full release being the 22nd. Feel free to check back here as we continue to cover this title! Playing Anthem at its best may require an upgrade.